If you’re like me, and you hoard spices, this post is for you. Do you have a cupboard full of spices that you rarely touch? Do you even remember when you bought them? 1997? 2011? I used to spend at least $3 every shopping trip to buy another spice because I thought I needed it. After all, my recipes called for fennel and ground white pepper so I couldn’t make the recipes without them. There were even a few times I bought a spice and came home to find the exact same spice already in my cupboard, barely used. I have done this at least a couple times in the past few years. If you’ll notice from my own spice list below, I have 6 spices that are duplicates. What a waste of money! Actually, I could’ve probably used a substitute spice instead of buying a new one or I could have used a different recipe altogether. I had a way of thinking that hindered me from saving money on groceries, and spices were no exception. So what do you do when you are faced with a bunch of spices and seasonings that you don’t use or have expired? I have a solution that might blow your mind. I would put them all in the “Expired Spices” column, then I would put Ground Marjoram first, Parsley Flakes second, and Thyme third. Here’s a little note about expired spices. Spices that have expired do not pose a health threat if you use them. However, if you want to be deemed the cook- or chef-of-the-year in your house, on your block, or in your city, you may want to use fresh spices over expired ones. I have plenty of spices that expired in 2011, but I’m not about to throw them away because all I want to do is save money right now. Now, if you use a spice and it tastes funky or it smells funky, just throw it out. 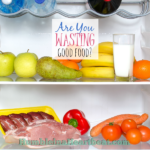 It’s not worth ruining your meals just to save a little money. 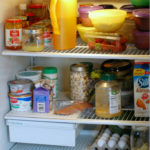 Read more about information on expired spices in THIS POST. If you happened to throw out any spices in this first step, you should still write them down so you remember to buy them if they are spices that you use regularly. I listed all my spices alphabetically and then put up to 5 recipes next to each one. Luckily, I was able to easily find recipes by searching for each spice, since most of my recipes are in OneNote. 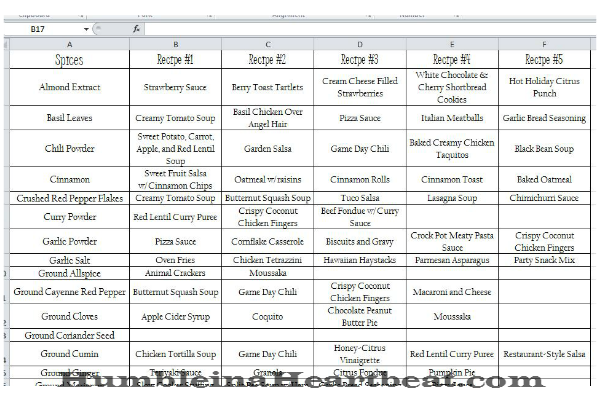 If you don’t use a system for meal planning and recipes where you can search by ingredient, just fill in the recipes on your spice list as you make meals. Over a couple months or a year’s time, you should have a lot of recipes listed. 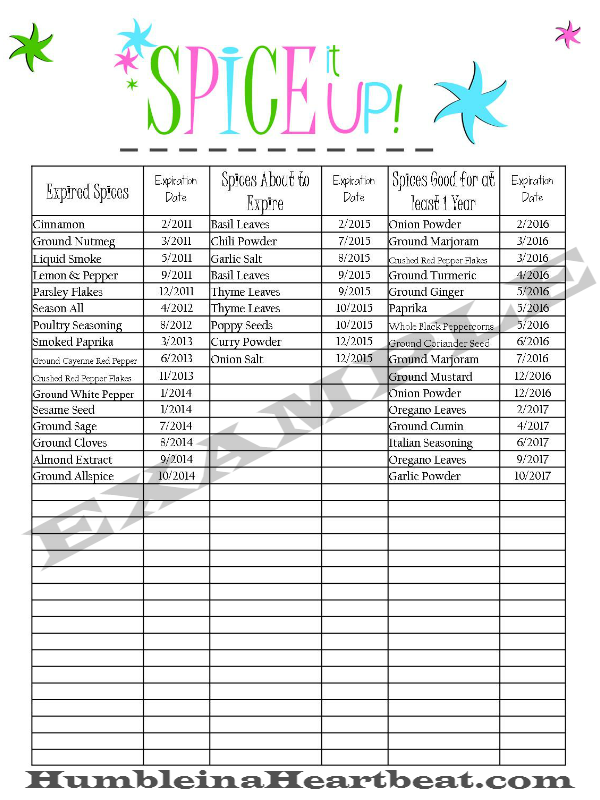 Download a spreadsheet to fill in your spices and recipes HERE. 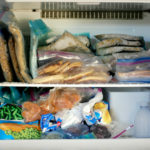 While you are planning out your menu for the week, look at your spices list and incorporate any meals that make sense. 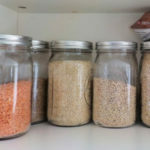 You don’t want to just randomly make meals without regard to all the other ingredients in your pantry, but by using your spices and not letting them just sit there, you are no longer wasting money on them. I know it’s not that much money, but it really adds up if you are buying spices every time you go shopping. Over time, I’ve personally spent approximately $126 on just the spices I currently have. I’ve thrown away plenty of empty spice bottles, so I know that I have spent over $200 on spices since I got married 6 ½ years ago! Right now, if I threw out the expired spices in my pantry, I would be wasting at least $13! Try to use your expired spices more often than your fresh ones so they can be rotated out sooner. 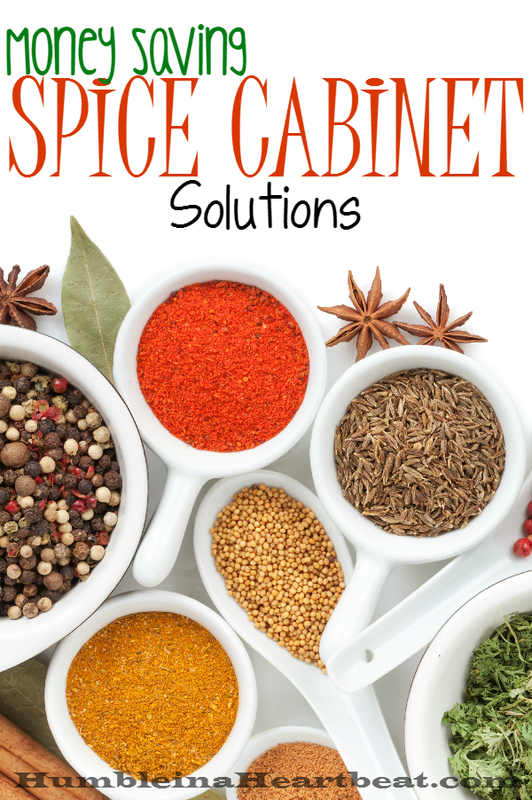 As I went through this exercise of taking account of all my spices, I realized that there are 10 ways you can save money on your spice cabinet. It takes diligence and some forethought, but it’s not super hard. 1. Keep your spices organized both in your pantry and on your list to avoid buying duplicates. 2. Use your spices often by keeping a list of recipes next to each spice. Refer to this list every time you meal plan. 3. If you don’t have a spice that a recipe calls for, substitute another one for it. 4. Only keep the most useful spices on hand in order to use them up quickly. That way, you won’t have any expired or old spices to worry about. 5. 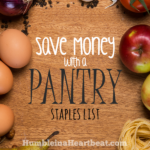 If you want to use a specific spice that you won’t use for any othe recipe, buy it in the bulk bins if you can’t find a substitute spice so you are only purchasing a small amount and not wasting the rest. I sometimes do this at WinCo. 6. Buy your most useful spices in bulk at a warehouse store (i.e. Costco, Sam’s Club, etc.) only if it is cheaper than buying a smaller bottle. 7. If the recipe calls for a fresh herb or spice, substitute dried if possible to use up a spice you already have. 9. Share or trade spices with friends and family to save even more! 10. Only buy your spices when you have a coupon or they are on sale. From now on, I should have no excuses about my overabundant spice cabinet. 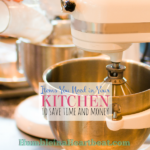 Now I know of several ways to save money on spices, and I hope they can help you, too! What spice do you use most often? Great ideas! Some I never thought of! I would love if you would come and share on my Friday Favorites linkup! Wow! You’re so organized. I’m jealous. I too had way too many spices but since we moved I got rid of most of them and now we just have the ones we used the most. I hope to keep it this way! Isn’t it funny how we can accumulate so much and then come time to move and we just throw it all out? That’s the only good thing about moving for me is that it gets me motivated to throw things away!